be a satisficer or use the secretary problem to find love! The researchers studied the evolution of risk aversion and discovered that it is in the human nature to go for the safe bet when their stakes are high. For instance whether or not mate. This human nature is traced back to the earliest period of their evolution. The study is computational (i.e., not a psychological study) and involves simulation that mimics the degree and range of risk-taking in human behavior. It suggests that we are satisficers, not optimizers* and that something like the secretary problem is not suitable for finding a mate/spouse [read Mike Trick’s counterpoint here]. In the secretary problem, the goal is to maximize the probability of finding the “best” secretary and its optimal solution by interviewing up to n secretaries, letting a few go (~n/e), and then selecting the next secretary that is the “best” so far The secretary problem focuses on finding the best possible solution (only the best will do) but the optimal strategy may lead to a suboptimal secretary (good but not the best) or no secretary at all. In fact, the optimal strategy leaves a pretty big chance of finding no secretary, which will occur if the “best” overall is one of those candidates that we let go at the beginning. 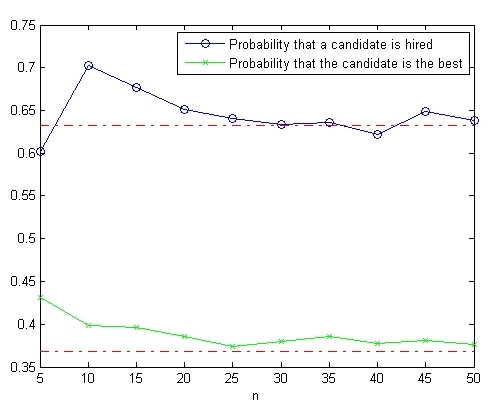 I have a figure below from a simulation showing the probability that a candidate is hired at all (the blue line), and it’s way less than 1.0.
the secretary problem is a useful model for selling a house (OK, this is about the secretary problem, not about finding love. But I love closing). academic blogs, a labor of love. * Yes, I know that satisficing and optimizing are really the same thing, but I finding-the-absolute-best and not-walking-away-without-empty-handed are really two different objective functions. Do you optimize or satisfice? What other OR models can be compared to finding a partner for life aside from the secretary problem? 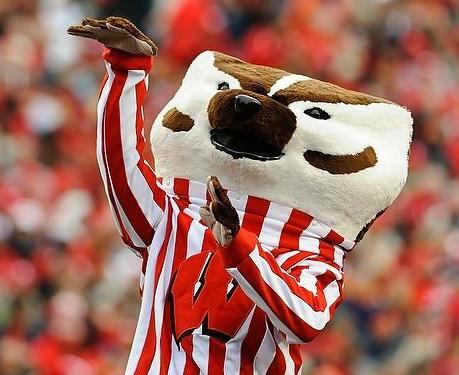 This entry was posted on Friday, February 13th, 2015 at 8:50 am	and posted in Uncategorized. You can follow any responses to this entry through the RSS 2.0 feed. Well, I am not so surprised about the conclusion as the saying goes that the person you married is often not your favorite one, or the one that loves you the most, but the ‘right’ one you met in right place and right time. The ‘right’ here might mean the ‘satisficing’ in this study.